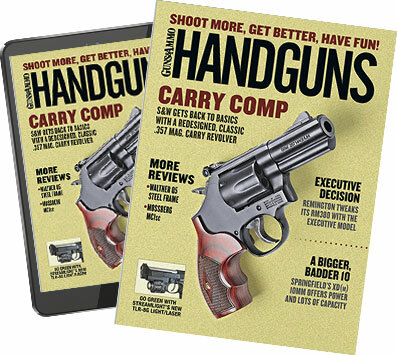 The majority of the concealed carry handguns I review are mid- to full-size semiautomatics. However, many shooters rely on much smaller, concealable weapons for self-defense. And why not? After all, lugging around a full-size gun day in and day out can be a drag. And who wants to go to all the trouble of strapping on a full-size gun when they go jogging or run to the store for a loaf of bread? I wear a 1911 on a daily basis. However, when I have to run a quick errand or go for my evening run, my old Smith & Wesson 642 is the gun I am most likely to drop in my pocket or fanny pack. Like many CCW holders, I know my firepower and range are limited with this weapon, but as the saying goes, "better the gun in your pocket than the gun on the dresser." Rodriguez had a gunsmith replace the front sight, do an action job and refinish his Smith & Wesson 642. He later added Crimson Trace laser grips. I was discussing this one day with Dave Biggers of XS Sights. He confessed to carrying a snubby, too, albeit in a much more effective configuration. Biggers' gun had one of his firm's big dot front sights and a heck of an action job by Bill Laughridge of Cylinder & Slide. On the range, his gun proved far more accurate and easier to use than mine. I'm no dummy, so I promptly boxed up my J-frame and sent it to Cylinder & Slide.I asked Bill to mill off the factory ramp front and cut a dovetail for XS Sights' big dot front sight, which features a large tritium insert surrounded by a thick, white outline. The bulbous dot instantly draws your eyes to the sight and is bright enough to see in any light. Its size, however, required Laughridge to open up the rear U-notch a bit, which he did perfectly. I also requested one of C&S's action jobs. While not terrible, the factory trigger broke at 12 pounds and was far from smooth. Bill's action job smoothed the trigger pull and took it down to less than 10 pounds. He also polished and rounded the trigger, which really enhanced the trigger's feel. Other work included chamfering and polishing the cylinder mouths to facilitate rapid reloads and stripping off the shoddy finish a friend had previously applied to my revolver. Once Bill stripped it, he bead blasted it and applied his silver Cerami-Coat finish, which is durable, corrosion-resistant and good looking to boot. When I got the gun back from C&S, I installed a set of Crimson Trace laser grips. I am a big fan of laser grips. They increase your maximum effective range and make good hits easier from unconventional positions, in low light and when shooting on the move. And CTs are just grips. They don't make the gun bulkier or heavier, and if the laser breaks, you still have your sights. Other than added expense, there is no downside to Crimson Trace laser grips. The over-large XS front sight (r.) makes a huge difference over the stock front sight (l.). That difference means getting the sights on target faster. I set the laser to hit just on top of the front sight at 15 yards, which is where the C&S test target indicated the gun was zeroed. After I adjusted the laser, I dry-fired it to get used to the sights and trigger. The trigger was excellent, and the sights were brilliant and easy to acquire. The better trigger and sights really paid off in the way of higher qualification scores. On our state's concealed carry permit shooting test, I was one point shy of a perfect score, which is much better than my pre-C&S best. Although I did fine at close range with the stock gun, the longer shots used to really hurt my score. The enhanced snubby's big dot sight and smooth trigger pull made the 15- to 20-yard shots much easier. In low light, the big dot sight was a big help, but the Crimson Trace laser grip really shined. I was able to make good hits fast in low light, and I even tried shooting on the move with the CT-equipped snubby. Even at speed, I had no trouble making decent hits thanks to the laser and improved trigger. I came away from my first range session impressed with the quality of Bill Laughridge's work and the effectiveness of the Crimson Trace grips and XS sights. Together, they help me get the maximum performance from my little belly gun. Now I don't feel under-gunned when I pack my snubby.